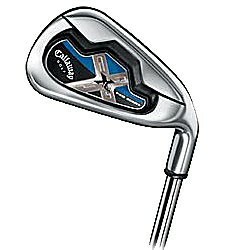 The Callaway Big Bertha 06 Iron Set 3-PW w/Steel Shaft is an impressive club if only for the innovative technology that was used in its creation. It boasts of an impressive performance that any golfer would appreciate if he wants to improve his play. This Iron has maximum forgiveness and provides off-center shot accuracy due to its notch weighting system which is identified with clubs made by Callaway. What makes this iron tick is the fact that its makers took some weight from the center and in effect the clubhead and relocating the weight to other areas such as the heel and toe. With this, you get a solid feel and more Moments of Inertia or MOI as well as added stability. This Iron is composed of 17-4 cast stainless steel which results in a stunning and beautiful high polish finish. The Callaway Big Bertha 06 Iron Set 3-PW w/Steel Shaft also boasts of other technologies like Variable Face Thickness, TruBore and S2H2.